You may have seen that in August 2016, Magento acquired a company called RJ Metrics. Since then, the data warehousing tool has gone through a couple of name changes (Magento Analytics) and is now dubbed Magento Business Intelligence (or Magento BI for short). From our experience using BI, we can honestly say it’s one of the best tools for providing insight into your data and we couldn’t recommend it highly enough. Magento BI is a data warehousing tool, which essentially means it pulls data from multiple different sources, normalises the data and allows to automate, visualise and share important data to the people who need to see it. It is a full-stack solution that is specifically designed to work with Magento and works with both Magento 1 and Magento 2 (Community/Open Source and Enterprise/Commerce editions). From a technical standpoint, it provides dash-boarding functionality, ETL processing into data warehouse (extract, transform and load) along with data replication and consolidation. It works by accessing your database directly via read only access and then replicating this periodically via different methods which you can control. It’s also worth us pointing out that on the whole, BI is easy to use which allows both technical and non-technical people access to model and analyse data. It’s worth pointing out that you can find common touch points between the different integrations and map this together to help you to get a full 360 degree view of your customers. An example of this would be by building your Magento store data with your offline POS system. As long as there is a common data point between the two systems, you could build a report to show the true lifetime value of these customers, which helps you to inform decisions around what you should be spending to acquire them. More integrations are always being looked at, so I’m sure others will be added in the near future too! Depending on the version of Magento BI that you go for, you get access to multiple pre-built dashboards and you can even build your own. Some examples of these are shown further up. We did some research into one of our clients recently which showed that 11.5% of their customers went on to place a second order on the store and 26% of those 11.5% of customers went on to place a third order. When drilling into the data further (all using pre-built reports), we found that the average first value order was around £12, the customers second order was around £35 and the customers third order was about £45. Using that data (in combination with some other metrics such as time between orders etc), we could determine that the business could afford to take a loss on their first order and statistically, they would benefit from this in the long term due to customers returning to buy again. This follows on from the example above, where we could see that the average time between orders was around 50 days. We’re now working with the client to look at methods to reduce this, by using tools such as DotMailer to build automated workflows. Our intention here is to look at ways to re-engage with customers and try to average the standard time between orders. 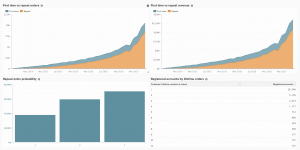 As Magento BI updates in the background every day using it’s replication functionality, we can track how this statistic is changing quickly and report back. This is a little bit more specific and would require the Pro version of Magento BI. 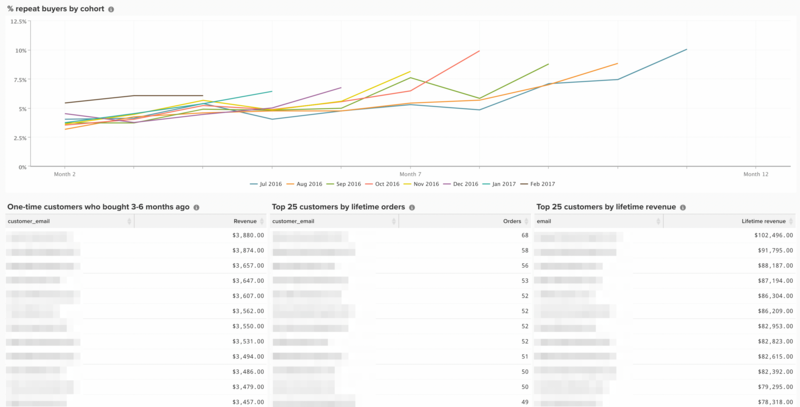 By building a custom metric, we’re able to track how different product pricing levels affect the sale rate and revenue of a particular product. We all know that if you drop the price of a product your conversion rate will increase, but finding the point between dropping the price of a product vs the conversion rate and profit achieved is much harder to track (or at-least it was!). We can use BI to see how the conversion rate of a product is impacted based on the price of the product, so testing different price points overtime allow us to show at which point we should stop discounting, because we’re actually making less profit by selling more units. Should I be using Magento BI ? A typical Magento BI customer would have a team size of 5-100 people, have revenues of £1m+ and have a strong desire to be more data-driven and optimised for growth. That being said, we feel this information can be extremely valuable to businesses of all sizes. You can setup pre-built email reports that send on a periodic basis to members of your company quickly and easily. For example, you might have a member of your team who wants to see revenue by sales channel on a daily basis, or another member who wants to see sales purely related to existing customers. These can be setup within the BI tool by a non-technical member of staff and sent out as little/frequent as you’d like. 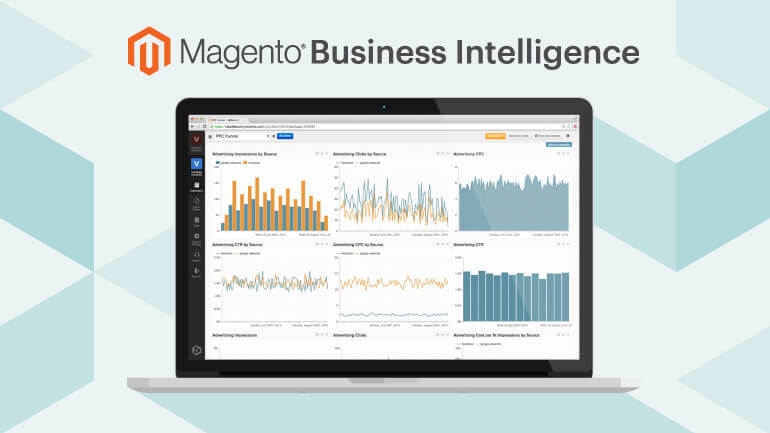 How much is the Magento Business Intelligence solution? It’s all well and good us showing you this amazing tool, but I’m sure you’re wondering the price by now! In all honesty, it’s actually extremely cost effective and can deliver a significant ROI fairly easily. There are currently two versions of the tool available which we’ve covered below. Magento BI Essentials is the starter version of the core product, it allows integration with any version of Magento along with integration into Google Analytics. It contains 75 pre-built reports and dashboards (which are excellent) and 5 pre-built dashboards. 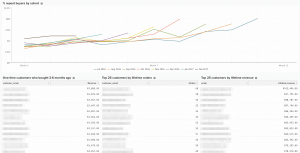 Alongside this, it replicates 5 tables from Magento which are used for the analysis, allows up to 10 users to use the product and starts at only $100 per month. There are no contracts for Magento BI Essentials and you can schedule reports to go to any email address on a pre-defined basis to keep users up to date. It’s also worth mentioning that if you’re a Magento Cloud customer (Magento’s hosted solution), you get access to the BI Essentials package free of charge as part of your subscription. At a starting price of only $100, we believe it’s a no-brainer for the vast majority of small businesses. Magento BI Pro is the core product that Magento are offering. It’s the most powerful and complete version of the product and allows integrations from multiple 3rd party data sources as listed further up in this article. There’s additional options such as a Cohort report builder, the ability to write SQL queries to build up custom reports and get more granular with your data to make decisions even better. Magento BI pro is setup on an annual basis starting at only $500, so when pitched against other products in the industry, it is extremely cost effective and a great fit for mid-size merchants. The price is adjusted based on various factors, but feel free to contact us if you’d like some more information on this. It’s statistically 5x harder to acquire a new customer than it is to retain an existing one, so using a tool like BI helps you tomake informed decisions, so you can ensure you’re investing in the correct areas. We’ve been working with the Magento BI tool, carrying out training and working with merchants to help improve their growth online. Whether you’re just looking for a demo of BI, or you want help setting up new dashboards, reports and key metrics, we would love to help. You can contact us via our contact form, or call us on 0113 493 1774.